R/C Blogs old4570's blog Mini-Review Jumper T12 review ( Part 2 ) The module ..
Jumper T12 review ( Part 2 ) The module ..
Now I just happen to own a few transmitters as you would expect from anyone who has been in the RC hobby for any length of time . My Turnigy 9XR pro has been running Open Tx for a while now with a iRangeX multi protocol module and I have been rather happy with the combo . So obviously I had to try the jumper module in the 9XR pro and the very first model to bind to ? It just had to be the Eachine E010 micro quad . You can understand my surprise when I got an instant bind with the Jumper module in the 9XR pro . The next micro quad had to be the JJRC H36 which had also failed to bind to the T12 . And once again I got an instant bind . Since the protocols come from the module and not the transmitter ? , I have to wonder about the discrepancy . My suspicions are it might be a Tx Firmware issue . I have this quad , the WL Toys Q333 that simply refuses to bind to any Tx other than the IR8M which has serious range issues . I just had to try for a bind with the 9XR pro Jumper module combo and colour me purple , if I did not get a instant bind . To test my theory on the firmware , I installed my iRangeX module in the T12 and tried to bind to the Eachine E010 . No bind . This module has never failed to bind before to the E010 or JJRC H36 and I just don’t see this being a module / frequency issue . As near as I can tell the module that comes on the T12 does not do PPM . I have tried and tried and nothing . I said it once and I will say it again . 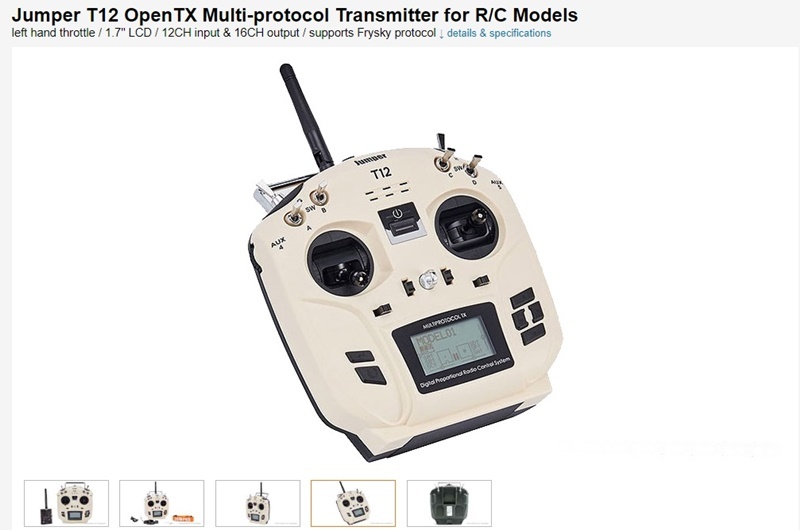 I think the T12 makes for an excellent companion transmitter to other OpenTx transmitters , especially when those transmitters can accept the Jumper module . Again no issues and I was quite easily able to bind to my Eachine E010 , something the T12 simply refuses to do . The module itself was a much tighter fit into the module bay on the x7 but it did fit . Now the hardest model to bind to that I own is the WL Toys Q333 and with the Jumper module in my Taranis Q x7 I had no problems getting a bind . Honestly I think I can finally take out my Q333 out for some real fun . But the T12 would not bind to the Q333 , once again sort of re-affirming that it might be more of a firmware issue rather than a module issue . T12 with other modules . So far I have tried the Jumper module in my 9XR pro with OpenTx and my Taranix Q x7 with OpenTx , so perhaps it’s time to see what modules may work with the T12 . Flysky module wont physically fit as the antenna gets in the way and plays road block . The next module I tried was the iRangeX IRX4 multi protocol module . And I had to try it in PPM mode ( yes I did ) . Setting the T12 to PPM mode for the external module I then bound the T12 to my Eachine E010 with no problems … Hmmmm , I should try the JJRC H36 since it uses the same protocol . No problems what so ever , as simple as turning on the H36 and then powering the transmitter . The transmitter and H36 bound with no problems and Iwas flying the H36 a few seconds later . Next I tried serial mode and a bind to my very old now WL toys 959 quad . It was a successful bind after a little fiddling turning off the PPM mode in the module . Next I try the Orange DSM Module . Now I simply could not get a bind ? Obviously I was doing something wrong . Rx is a AR6100e DSM mini Rx . Now I was not sure if the module was working or not , so I put it into my 9x and after a lot of fiddling got a bind . Transferring the module to the T12 the bind to the Rx held and it worked right away . Obviously I had to create a new model and try for a bind again , this time successfully ! Set Ext module to PPM , Orange module should beep you to let you know it is powered and ready . DSM Rx can be really picky when it comes to binding , this one wanted the battery plug all the way on the other side away from the bind plug to get the Rx to bind . Bottom line is , other modules will work . Especially if you remember how to use them , my excuse is I haven’t used the Orange module in maybe 5 years or more . To bind , power the Rx and then push the bind button on the back of the Orange module and turn on the Tx . Keep holding the bind button till the fast flashing lights in the Rx turn into slow flashing lights or go solid . Once the Rx lights are solid , turn the Rx off and turn your Tx off as well . Now turn on your Tx first and wait for the Orange module to beep you and then power up your Rx , you should have a nice solid bind . Some interesting stuff going on there . C) The jumper module apparently does no do PPM (?) I have contacted Jumper in regards to this ( Will they reply ) . Last edited by old4570; Dec 07, 2018 at 04:34 AM.